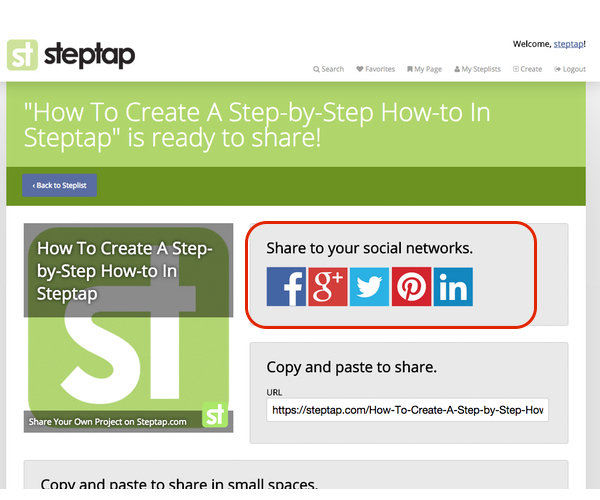 Author: steptap	| Website: Create, Manage and Share your own how-to instructions! 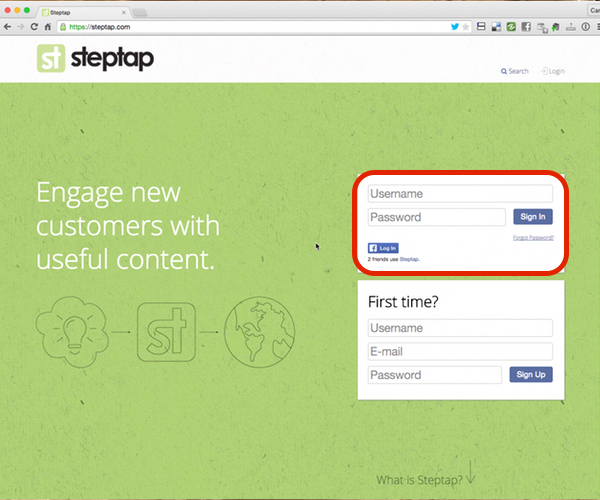 Create, Manage and Share your own how-tos with Steptap. A basic account is free, and includes everything you need to make great how-to instructions. 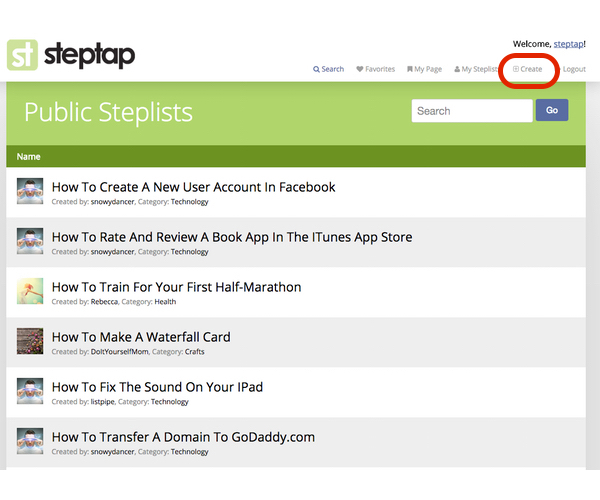 Visit Steptap.com and start your own free account by completing the First Time form on the home page. 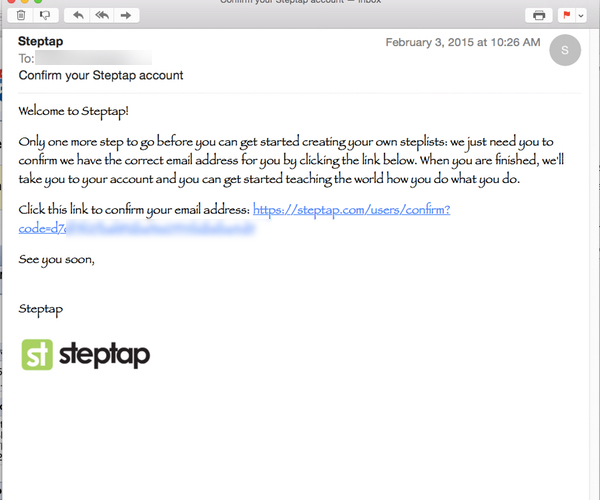 Check your email for the confirmation request from Steptap, and click on the confirmation link when you receive it. Login from the Home Page, using your new username and password. Once you are logged in, click CREATE from the top menu. Name your steplist by completing the beginning words "How to...". Select your PRIVACY setting. If you plan to make this live immediately, set it to PUBLIC, otherwise keep it at PRIVATE until you are ready. Set your Category by choosing one from the pull down list. 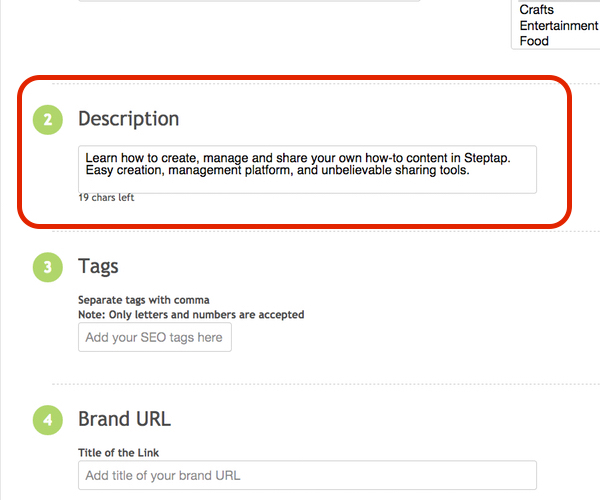 This is a 160-character description of your steplist that will appear in search results. Keep an eye on the character countdown to make sure you are not going over the character limit. Keep it brief and to the point. 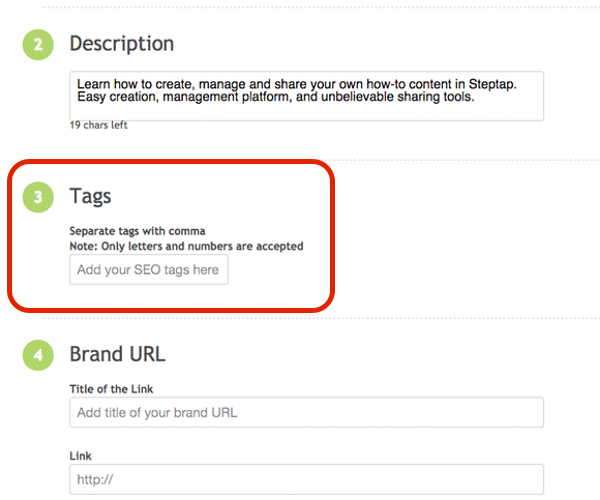 Tags are used for Steptap search and are included in the SEO meta information for SEO indexing. Note that only alpha-numeric text can be included (no special characters). Be sure to separate each entry with a comma. This is the call-to-action that will appear in the title bar of your steplist. Users will be able to click this link and go directly to your site. 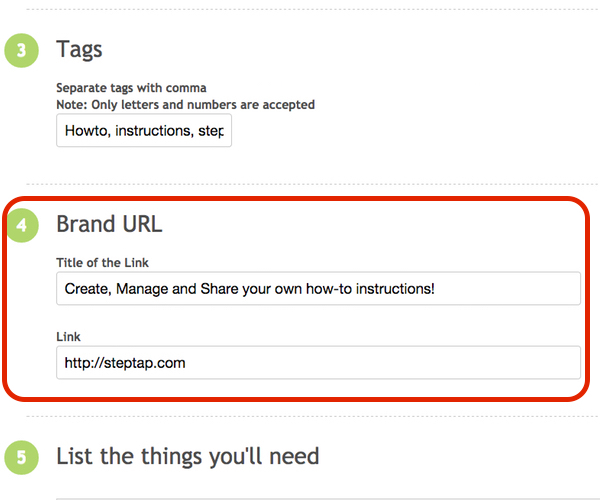 Tip: Create the Brand URL as a compelling call to action, and link directly to a page on your site where users can purchase or sign up for your product. List the Things You'll Need. This is your ingredients list, or materials list, or required items to complete this project. You can add as many as you need by selecting the ADD ANOTHER ITEM button at the bottom of the section. This field is for the name of your Required Item. Tip: Keep it simple and technically descriptive. Indicate the quantity needed of your Required Item. Optionally, you can identify the type of Required Item from our pull down menu. Types include common measurements, volumes or distances. 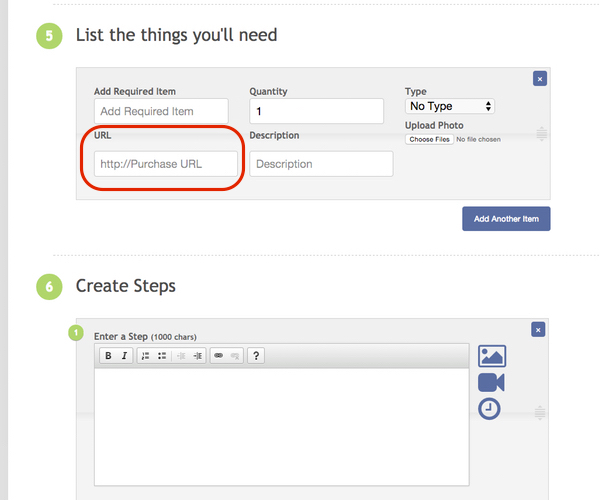 Premium users have the option to add a Purchase URL to their Required Item listings. In this field, enter the URL to where your readers can purchase this particular Required Item. This can be an affiliate marketing link, or a link directly to a store catalog. This field is optional, and the information appears on rollover when viewing this steplist. Premium users have the option to include a description of the Required Item. This description will appear on a rollover of the Required Item in the steplist, and is a great place to add a call-to-action or description text about the Required Item. Premium users can upload an image to represent their Required Item. This image will appear as a small thumbnail upon rollover of the Required Item on the steplist. Tip: Keep this image simple and clear. If you need to delete a Required Item from your list, you can click the small "x" in the top right corner to delete it from your steplist. This comes in handy when your product or process chances and you need to make edits to your steplist. You can re-arrange the order of your Required Items by grabbing the light gray handles in the middle of the box on the right. Simply drag your Required Item to a new position in the list. You can add as many items as you need to complete your project. If you accidentally add a new box, simply delete it and move on. The next section describes the process of adding steps to your steplist. 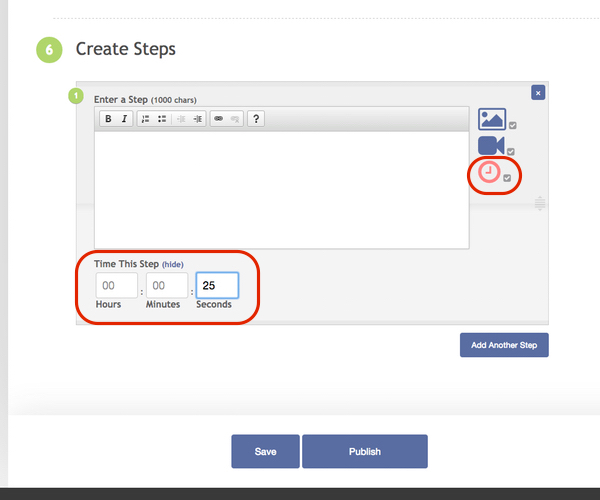 You can add as many steps as you need to compete your project, and there are options to add images, video from YouTube, and time each step. Enter the text of your step in the large text field. Keep it simple: There is only enough room for a concise, to-the-point step. If you need more room, break it down into more steps; this will help your readers. 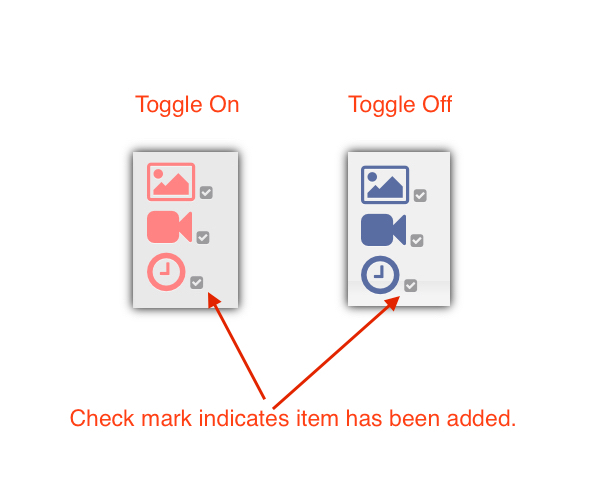 You can toggle on or off the image section. When toggled on, the button turns red, and the new section appears under the large text box. Click BROWSE to add an image from your desktop. 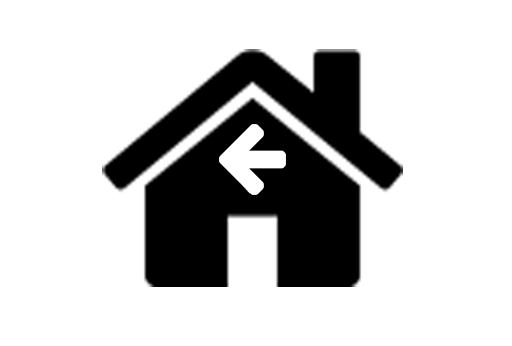 A checkmark next to the image button indicates an image has been assigned. Tip: Image size is best at 600x500 and 72dpi. You can toggle on or off the video section. When toggled on, the button turns red, and the new section appears under the large text box. Add the URL to your selected YouTube video. 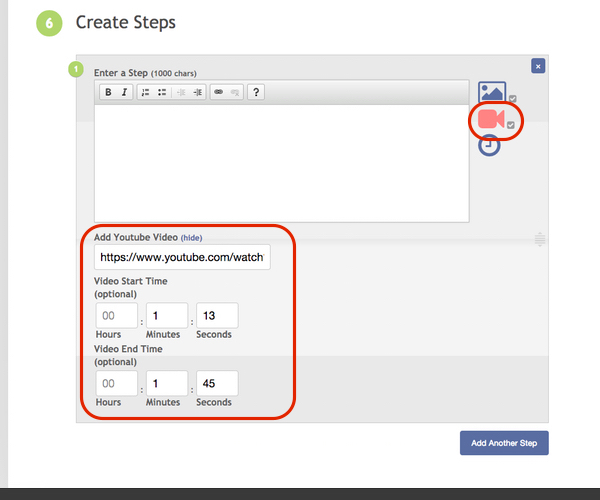 You can also indicate a starting and ending time to show only a portion of your video. A checkmark next to the image button indicates a video has been assigned. Tip: Only YouTube is supported at this time. You can toggle on or off the timer section. When toggled on, the button turns red, and the new section appears under the large text box. Add time in seconds, minutes and hours to indicate how long this step should take for the reader to perform. A checkmark next to the image button indicates a time has been assigned. Button Review: The media buttons on the right are toggle buttons. They will open and close each section to help you keep a clean interface, and to remove clutter when you are moving steps. 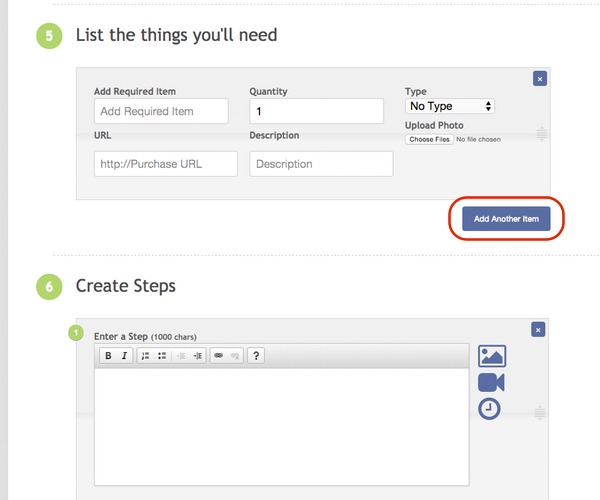 The small gray checkbox indicates when an item has been assigned. The step box has a delete button in the top right corner. If you need to delete a step, click the x in the top corner to remove it from your steplist. Each step can be re-arranged to a new position in your list. If you have created steps out of order, or need to add a new step into the middle, use the grab handle to drag the step to a new location. Don't forget to SAVE your changes, at the bottom. Add Another Step by clicking the ADD ANOTHER STEP button at the bottom of the step form. 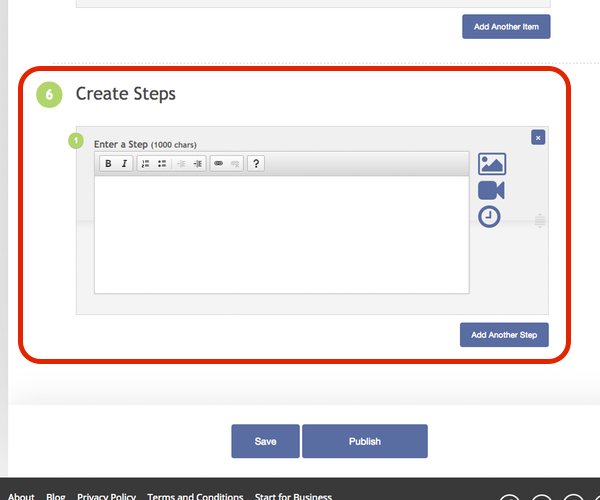 You can add as many steps as are required by your project. Tip: Keep them short and simple. Click the SAVE button to save your changes as a Draft. 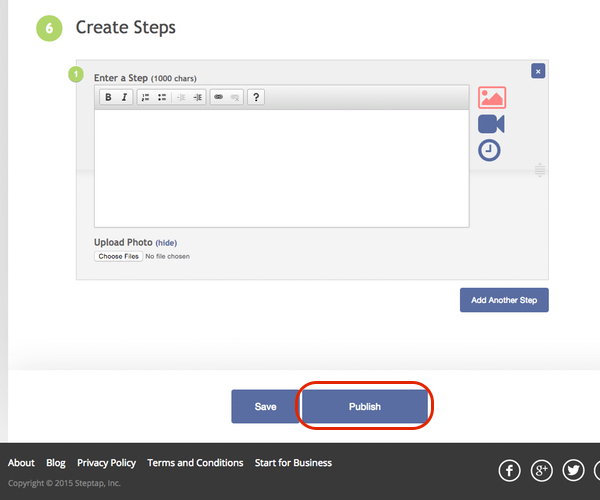 Click the PUBLISH button to publish your new steplist live to the internet. Share your new steplist from the Share page. 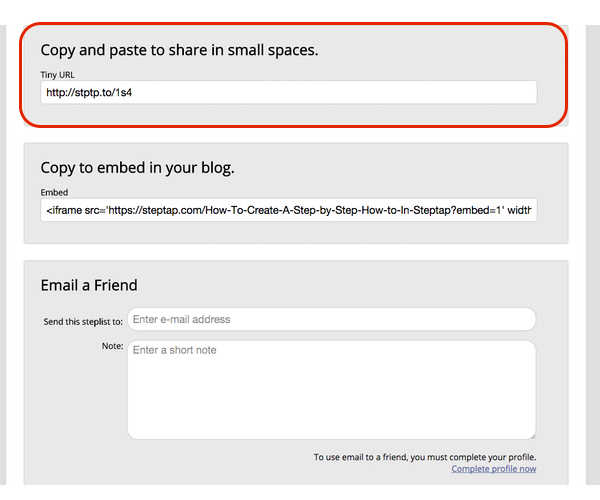 The Share page will present itself when you Publish. You can always get to the Share page by clicking the Share icon at the top of any steplist. In the Share page you can share your steplist to the top social networks with a single click on their icon at the top of the Share page. You will need to be logged into your social networks to share. 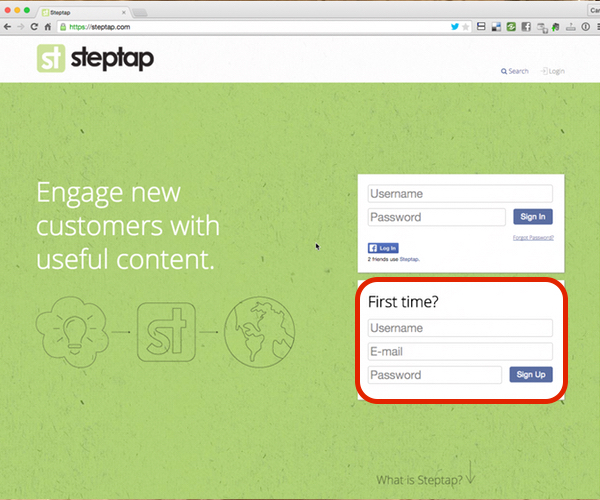 Steptap will ask you to login if you are not already. 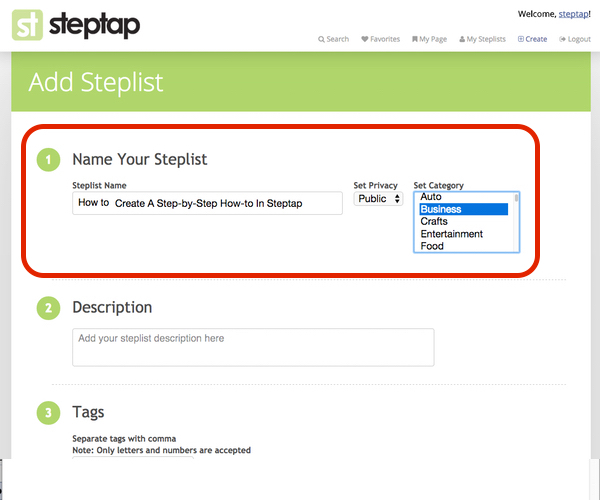 Steptap creates an image for your steplist automatically, and will size it to fit any social network you select. 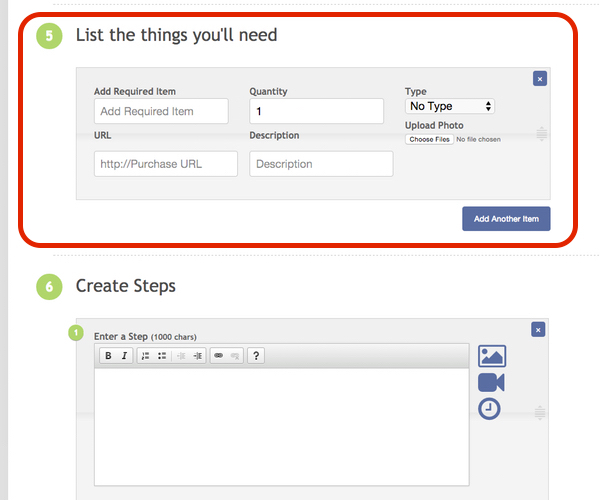 You are also provided with a direct URL to your steplist on the Share page. 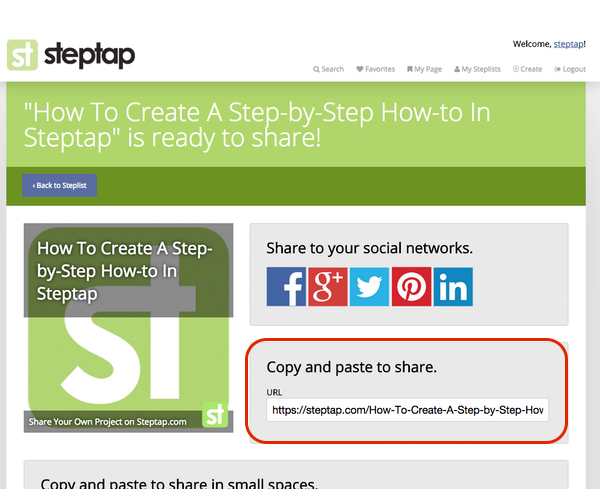 Copy and paste, or link to this URL to share your steplist post. We have also provided a short-code URL in the event that you want to save some room. 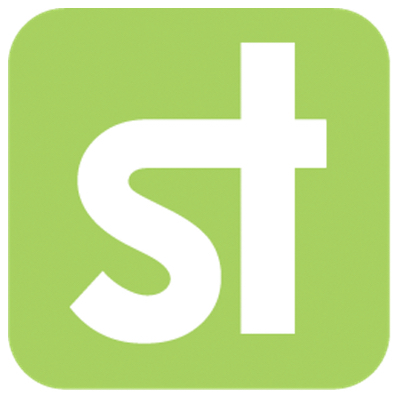 This is a Steptap.com short URL, and is fully tracked in your analytics (Premium accounts, only). 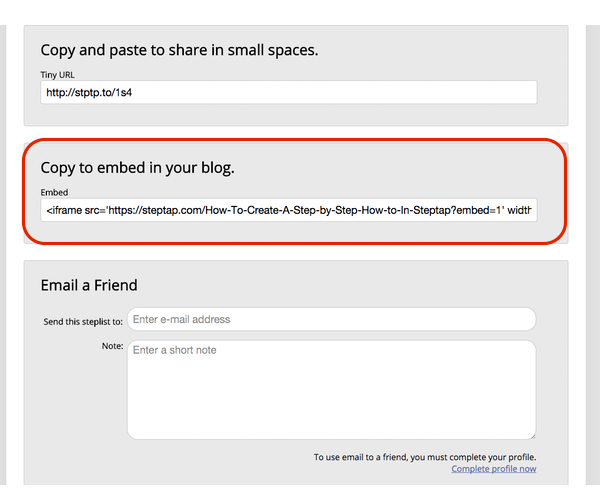 We provide an embed code that allows you to embed your steplist directly into a blog or website. 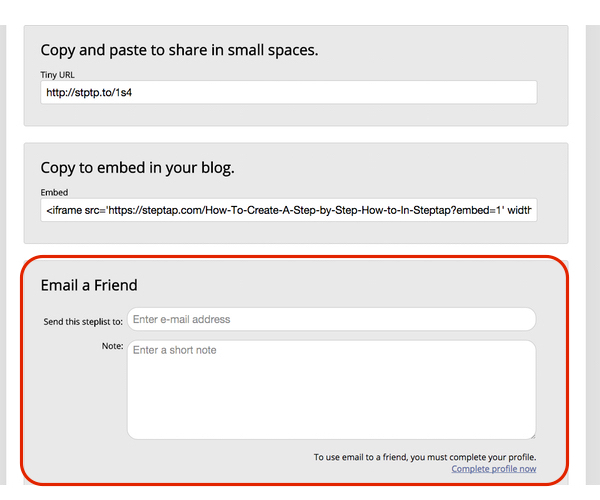 Our Email a Friend form allows you to send your steplist directly to an email address from within the system. You can download a printable PDF of any steplist if you prefer to print it out. This is handy if you are working in a dirty environment or don't have immediate access to an online device. 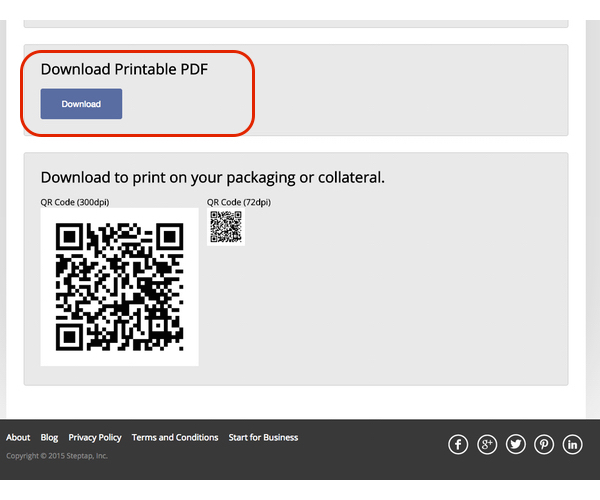 You can print and incorporat QR codes into your print advertising or instructions. 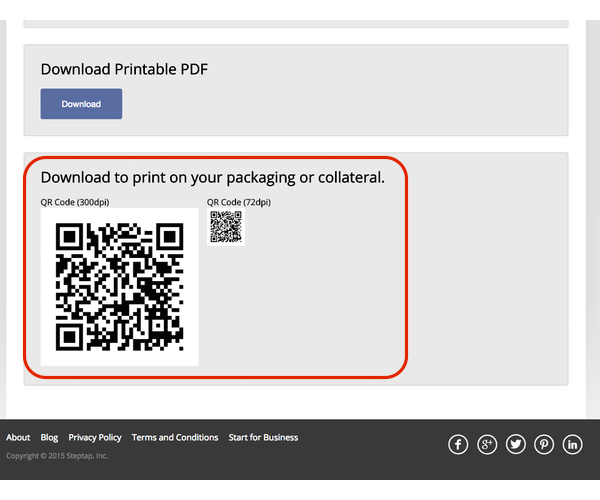 A unique QR code is created for each steplist, and is available to copy from the Share page. 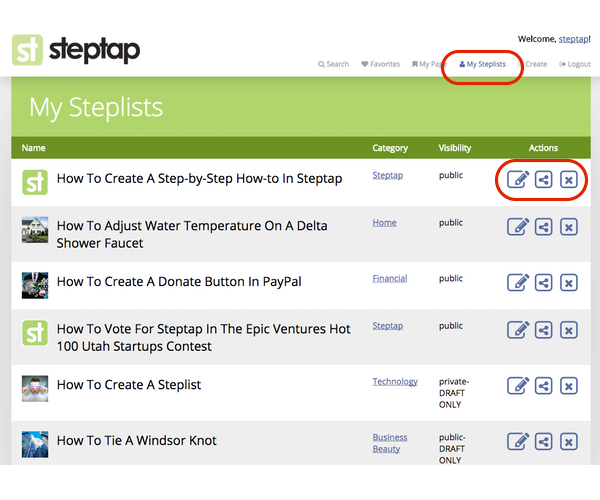 You can access the steplists that you have created in the My Steplists page. From here you can edit, share, or delete any steplist you have created.